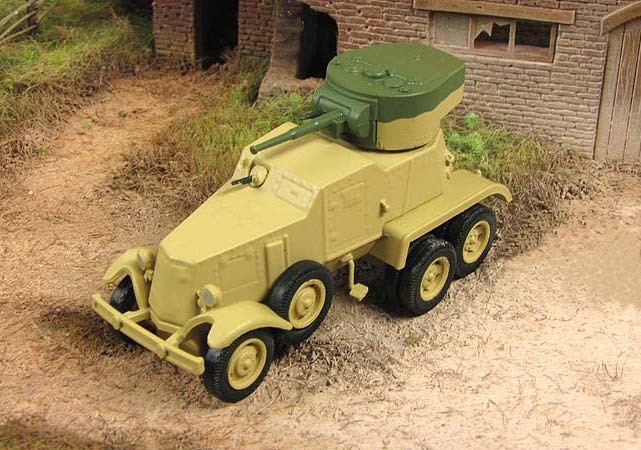 The BA-3 (Russian: Broneavtomobil 3) was a heavy armored car developed in the Soviet Union in 1933, followed by a slightly changed model BA-6 in 1936. Both were based mostly on BA-I, the most important development being the new turret, same as in the T-26 m 1933 and BT-5 tanks, and also equipped with the 45 mm main gun. Around 180 BA-3 cars were built at the Izhorskij and Vyksunskij factories, until production ended in 1935. BA-6 followed with 386 cars produced between 1936 and 1938 in Izhorskij factory. 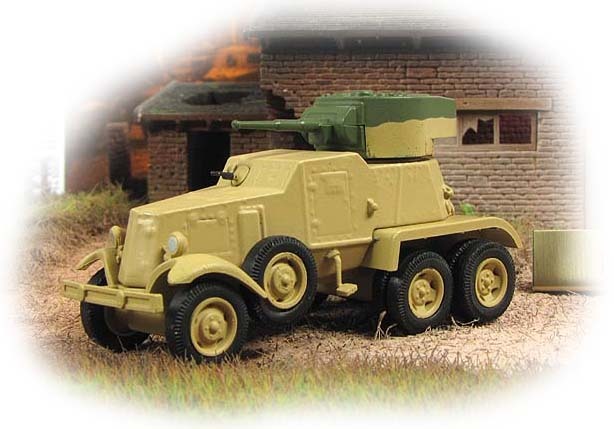 Most of BA-3 production was based on the Ford-Timken chassis, a 6×4 modification of the US Ford AA 4×2 truck, but the last batch was built on Russian version of the same chassis - GAZ-AAA, continued to be used in BA-6. The biggest limitation of the BA-3 was the mobility, limited to roads or very hard ground, the result of unnecessarily large weight. The innovation that slightly improved mobility were the auxiliary ("Overall") tracks that could be fitted onto the rear tandem wheels, converting the car to half-track. The BA-3 is externally very similar to the BA-6; the BA-3 retained door in the rear of the hull that was not present in the BA-6. 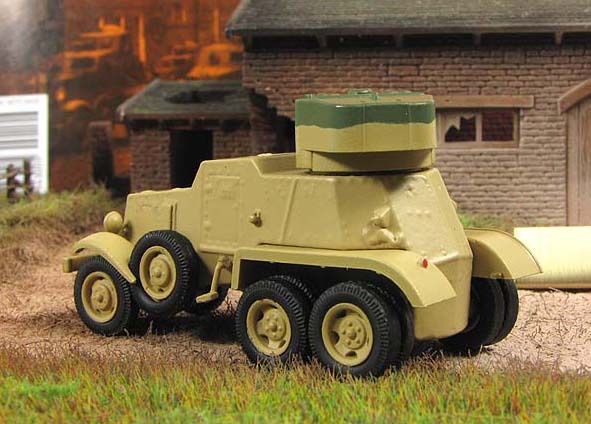 More important improvement of BA-6 were the new GK tires, filled with sponge (porous rubber), and thus much less vulnerable to small-caliber fire. On the downside, the tires reduced both the speed and range of the vehicle, despite it had a somewhat thinned armor. BA-3/6 cars were superseded by BA-10 model. 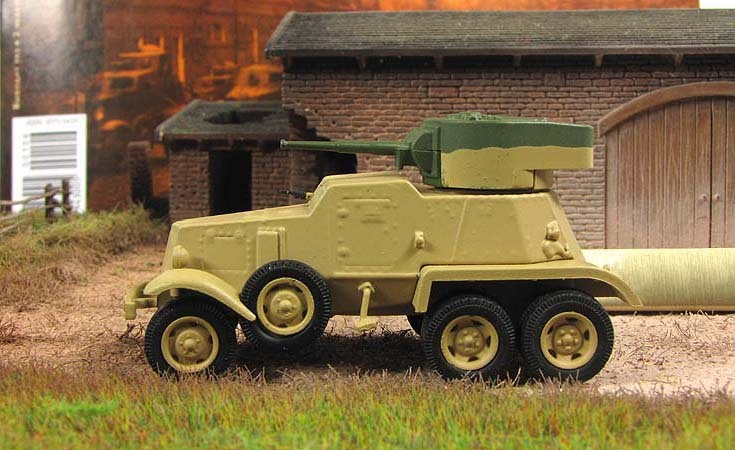 All cars of this series were very heavily armed for the era; they could knock out other vehicles with ease, including tanks. However, their thin armor made them vulnerable to heavy machine gun fire and small caliber cannon fire. A prototype railway BA-3ZD variant was created in 1936, but was not accepted for production. The BA-6ZD was produced in limited numbers. The BA-3/6 were used in combat in the Spanish Civil War, against the Japanese in the Battle of Khalkhyn Gol, in the Finnish Winter War, and against the Germans in the early stages of the Eastern Front. 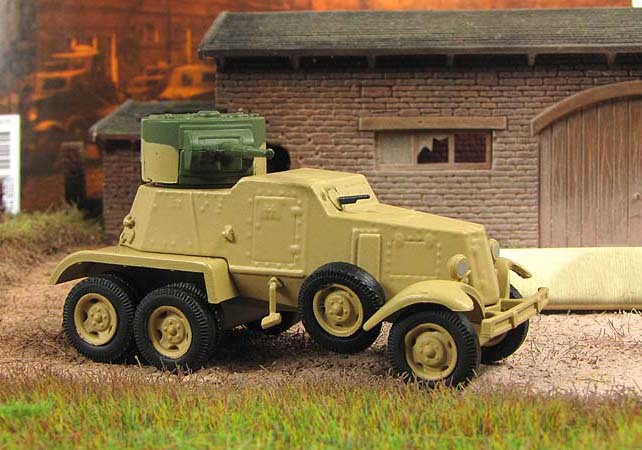 Ironically, the German Army used a few Spanish-built six-wheeled armored cars that were close copies of the BA-3/6 series. 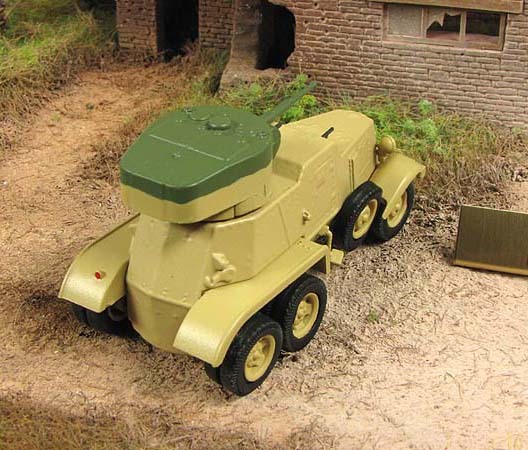 Later in the war, the BA-3/6/10 were replaced in the Red Army's heavy scout vehicle role by light tanks, such as the T-60 and T-70. A few captured BA-3 cars were used by Finnish army under designation BAF A (sometimes also BA-32-1), and captured BA-6 cars under designation BAF B.